Hello! Hope you're all having a good week. CCT theme this week is 'make your own'. 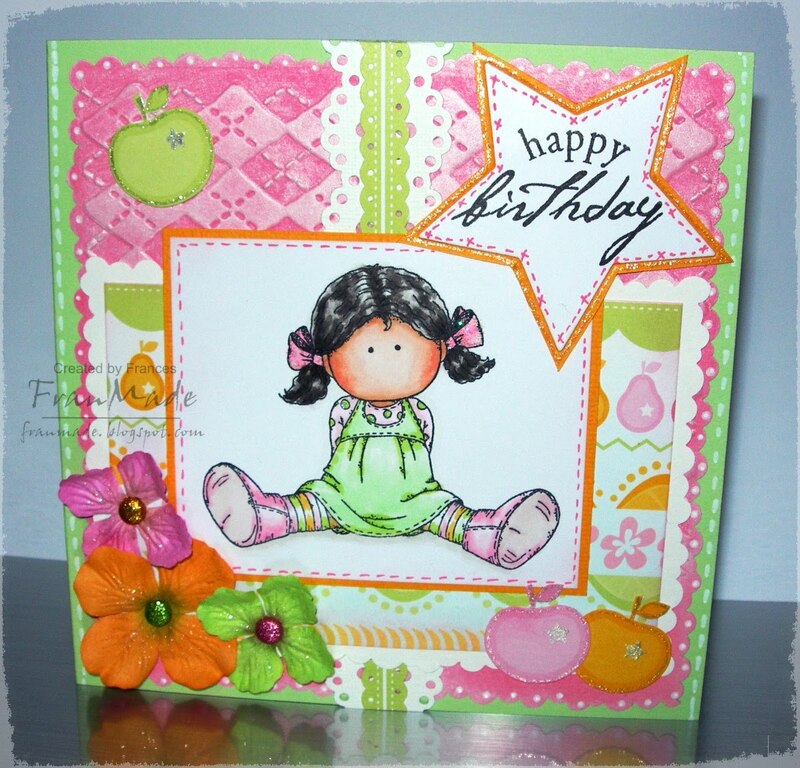 So for my card I have stamped my own backing paper and made my own paper flower to go with another Pure Innocence cutie. The background is a fab Hero arts stamp I finally managed to find in the UK after seeing it on Alice's blog a few weeks ago and loving it. I know you could get similar effect by cutting out cloud shape masks and then sponging over them but this is so much quicker and something about it just called out to me & I had to have it - ever get those?! 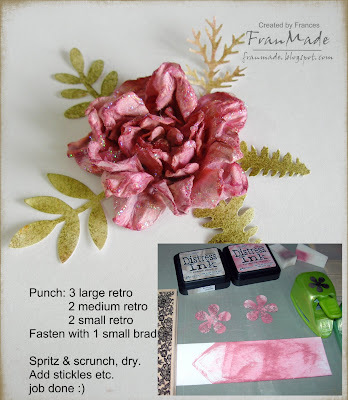 Then the flower I made was sooo much fun and it was after seeing this fab tutorial (I used slightly fewer number of punched out shapes as I was impatient but I think it still works.) So easy, which is what I love, but the results are fab. May be seeing a few more of these in the near future. Boo! Bet you weren't expecting a post till Thursday :) I got couple of cute CC Designs stamps land on my doorstep at the weekend and I just had to ink this cutie up. Tools: Nellies mutli frame, scallop circle punch, MS ATP punch, EK success 'paw print' edger punch - so cute! Had a little splurge at the craft show in Aintree yesterday even though not as good as hoped! Mainly just fed my MS punches & nesties addiction (from Oyster crafts - have yet to find anyone else to match their prices) and lots of pearls & bling from Hobby House - best bit was getting some heart paper doilies that I've always wanted but could never find anywhere. Well, hope you all have a pleasant start to your week & I'll be back Thursday with my CCT card. Hello! Hope it's been a good week for everyone and the whole ash saga hasn't affected you. My brother & family are stuck in HK waiting for a flight home but at least they have their own place there and not having to find/pay for extra accomadation but it must be awful not being able to get back when you want. Now that ban has been lifted I hope they manage to get back soon. I think for those reading about it abroad you'd think it was heavy ash or something major but no, everything here on the ground appears normal. The only sign is our car looks dirtier - if you look up close, it's like a fine grey chalk dust but otherwise you wouldn't be any the wiser! Anyway, back to my card for the week. CCT this week has a lovely sketch by Andrea, for you to use. I've turned the sketch on it's side, found some scraps in my scrap box and inked up the cute Hanglar from the kit I got off ebay. The colours are a bit on the zingy side - kinda remind me of ice cream sorbets mmmmm but I think it fits the nice bright sunshine we have been getting recently. I've coloured my Hanglar with Copics but it was done late at night and I was tired so it's not my best colour work and I'm not too happy with the hair but it'll do I think. 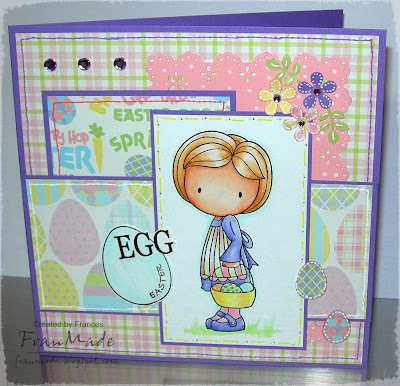 The pink card behind her has been cuttlebugged with an embossing folder and white ink swiped over it. I've used various border punches including a fab EK success one called 'bumpy road' which is the small uneven scalloped edges all around the pink piece and the white piece. 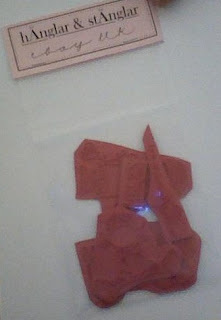 I love it, because it's uneven you can use it around all four sides without needing a corner punch to match up the ends. 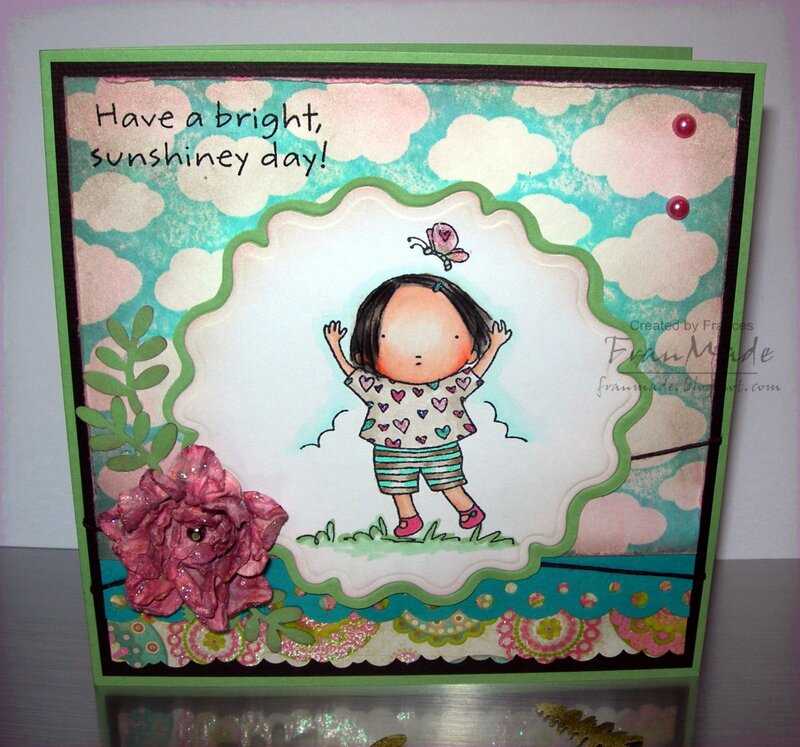 Sentiment cut with stars Nesties then just added some flowers and sparkly brads to finish. The apples were just cut out from the DP and I added bit of Sakura stardust pen to the edges and also to the centre of the flowers. Stamps: Hanglar from kit they are currently selling on Ebay UK to uk buyers only. Sentiment from Hero arts set. 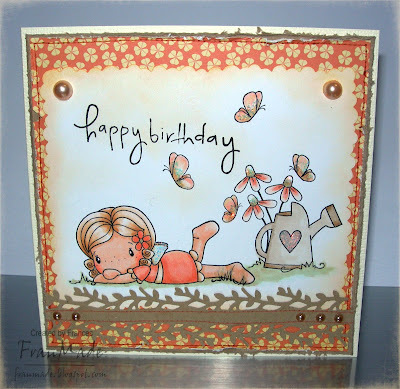 CCT this week wants you to get touchy feely . . with your card that is! 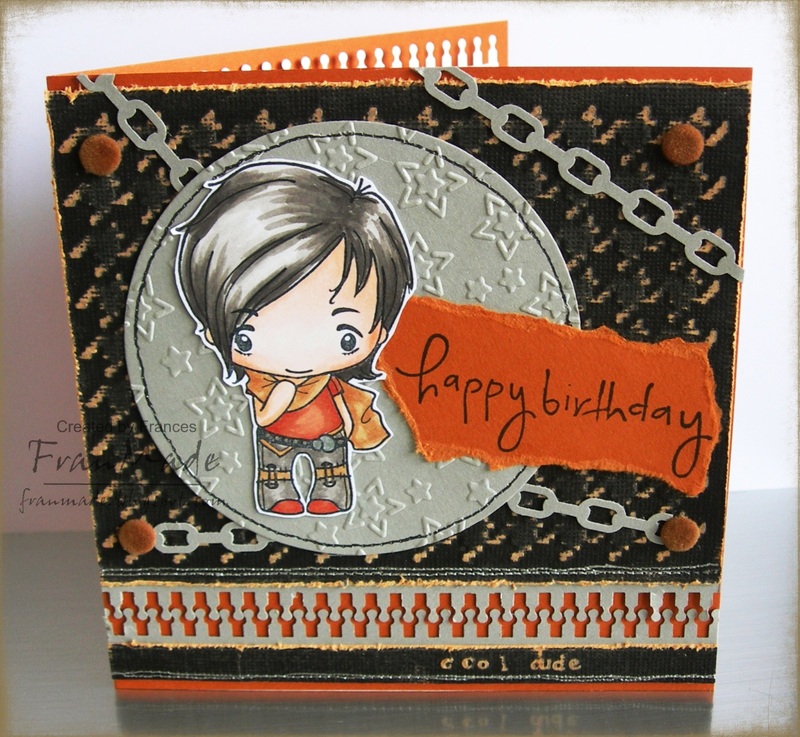 For mine I've used lots of embossing, tearing & distressing to create lots of texture in the cardstock and then I've added some velvet covered brads which are nice and fuzzy to the touch! I'll be needing a birthday card for my nephew soon so thought I'd use this cool Eric stamp from the Greeting Farm and I wanted to use some of my fab new EK success border punches - how cool is that chain punch and also that zipper one (which has been punched twice & staggered against each other)?! Sorry for the rather simple card but that's about all I can come up with at the moment. 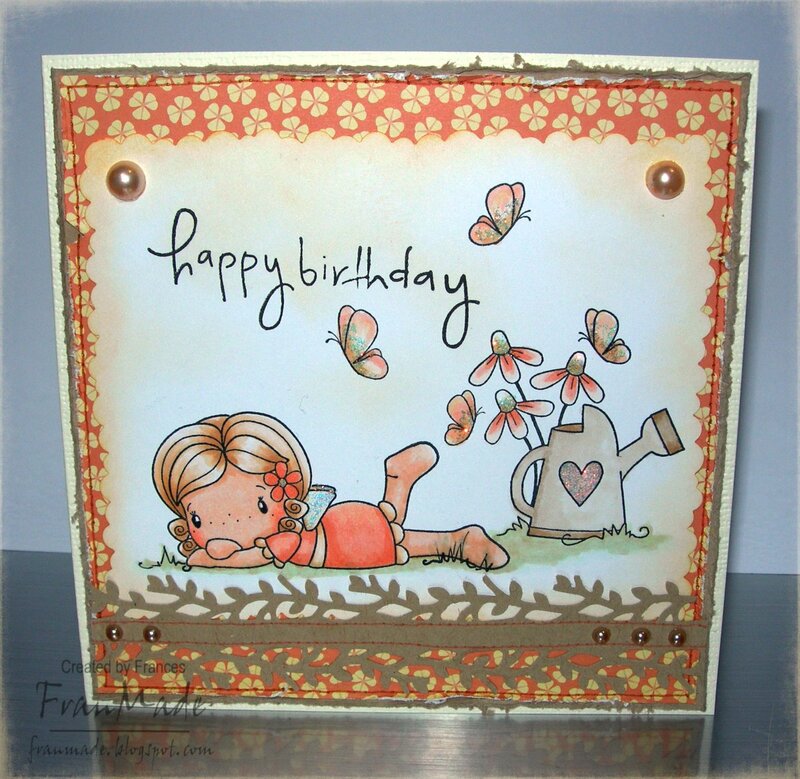 Off to do see which ones of the new Magnolia stamps to get . . kicking myself for not getting the kit this time as I'm loving the fairytale/princess theme - oh well, will just have to get them seperately. Hello! Just wanted to pop on and say that cards will be a bit thin on the ground for the next couple of weeks I think. Adjusting to my new work schedule (6 evenings and 1 lunch) is seriously messing with the old craft mojo. Well, plus playing with my new lap top may have something to do with it too. We moved my old PC to the shop for work & (surfing :D) purposes when it wasn't busy i.e what I'm doing now >.< and rather than get another one to replace it I wanted a laptop instead so that I could use it around the house and in the garden when summer finally arrives ;D Hopefully I will having something to show soon. I shall be mounting these up later and hope that gets me in the mood for crafting again. Right, it's nearly closing time now, so I best go help shut shop! 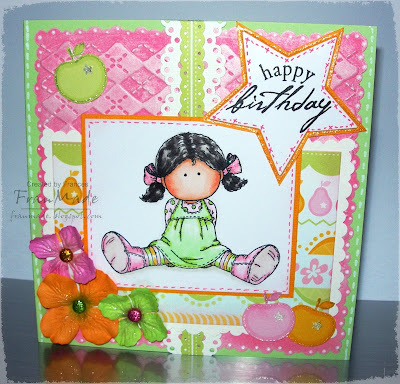 CCT mono mania ~ just peachy! Hello. Hope you all had a lovely Easter and didn't overdose on choccy eggs too much! CCT theme this week is 'Monomania' so just 1 shade of colour. Well, that's all from me for now, have a lovely day and thanks for popping by. off to Andover for few days to see the inlaws. Have a good one. Really not much else to say about this one, kept it simple as I wanted to keep it light & fresh in keeping with the spring colours/theme.